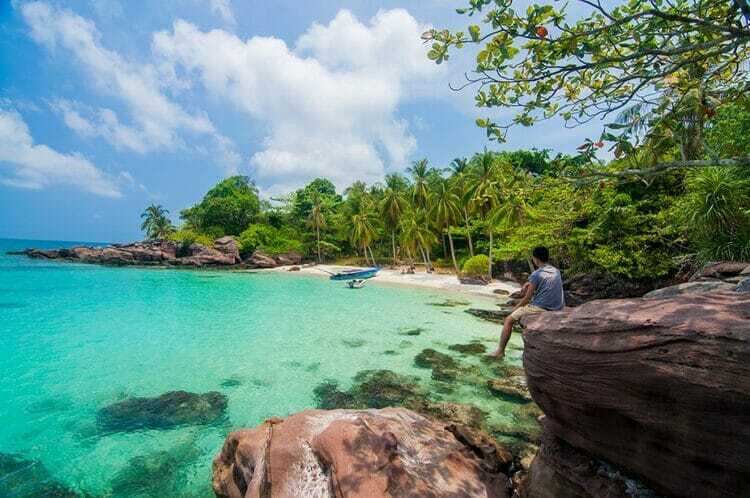 Have you ever heard the name Mong Tay Island (Hòn Móng Tay) in An Thoi Archipelago (Quần đảo An Thới), toward the south of Phu Quoc Island (Đảo Phú Quốc), Kien Giang province (tỉnh Kiên Giang), which is considered “Robinson Island” of Kien Giang both due to its poetic blue sea and white sand, as well as excess wilderness? If you are too familiar with destinations such as Bai Sao (Bãi Sao), Bai Kem (Bãi Kem), Bai Dai (Bãi Dài), or Ham Ninh fishing village (làng chài Hàm Ninh), Mong Tay Island is a recently noticed “uninhabited island” that you will feel sorry if you do not discover once in your life when coming to Kien Giang. Lots of people setting foot on Mong Tay Island admits that one of the main attractions for them is the unique name of the island. “Mong tay” means “nail” in English. The reason for this name is because, in the past, there were plenty of trees scientific called Pemphis Acidula grew on the island, of which the leaves have the similar shape as nails. However, so far the number of trees has been declined significantly. Mong Tay Island is in Duong Hoa commune (xã Dương Hoà), Kien Luong district (huyện Kiên Lương), off Kien Giang province. 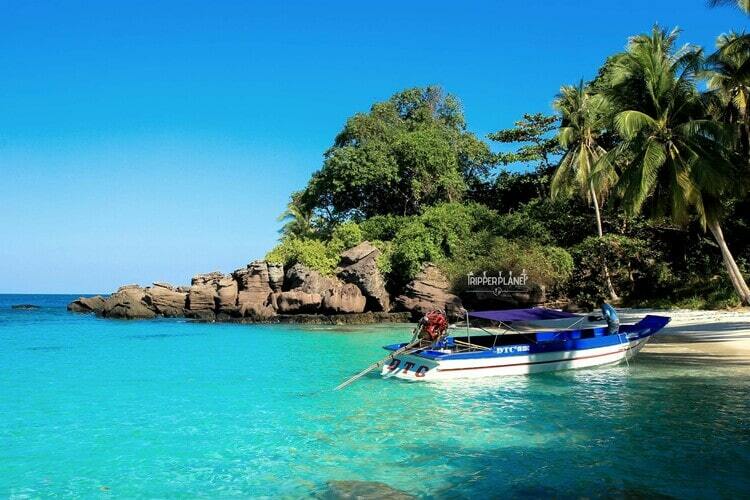 The island has the location between Ba Lua (Bà Lụa) and Hai Tac (Hải Tặc) Archipelago but belongs to none of them. It lies away from the shipping route, so normally there are very few ships passing by. It does not even have human intervention; this is the origin of the name “Robinson Island”. In addition, when you are here, you will hear about the legend of a “real Robinson”, the story of Mr. An – the “island god” who has been on this deserted island for 13 years. Although he was blind, he swam very well and was able to fast for several days. Almost all the original pristine beauty of Mong Tay Island still remains intact, no impact of human influence on the liberal-but-mysterious scenery of this place. This is really a masterpiece that nature bestows on the human with green coconut trees rising vertically along the coast and a stretch of the white sandbank. The water here is so clear that you can clearly see the colorful coral reefs and flocks of pretty marine fish swimming below, which are “specialties” of the island. The coral reefs are quite shallow, thus you can freely enjoy the experience of snorkeling and watching them without worrying about the requirements of superior diving techniques. It is also known that the coral ecosystem of Mong Tay Island is ranked first in Vietnam in terms of the abundance of species. Along with contemplating coral, visitors can go fishing. Because there are yet accompanying services, you need to bring your fishing rod from the mainland or hire one from the canoe’s owner at the port. It is exciting that even the worst fisherman can become excellent since you just need to drop bait to catch the fish. And it is more interesting to relish the achievement after a fishing session on such an adorable beach. For those who like photography, Mong Tay Island is a paradise of appealing photos with a background of white sand and turquoise sea. Let you get up early or walk around in the late afternoon to capture the most wonderful moments of the dawn and sunset. The pure landscape, the sound of the waves, the wind blows, and the pine tree rows give you the feeling of perfect harmony with the immense space of heaven and earth, and help you escape from the chaos of everyday life. All of those are certainly enough to stir discovery-passionate hearts. 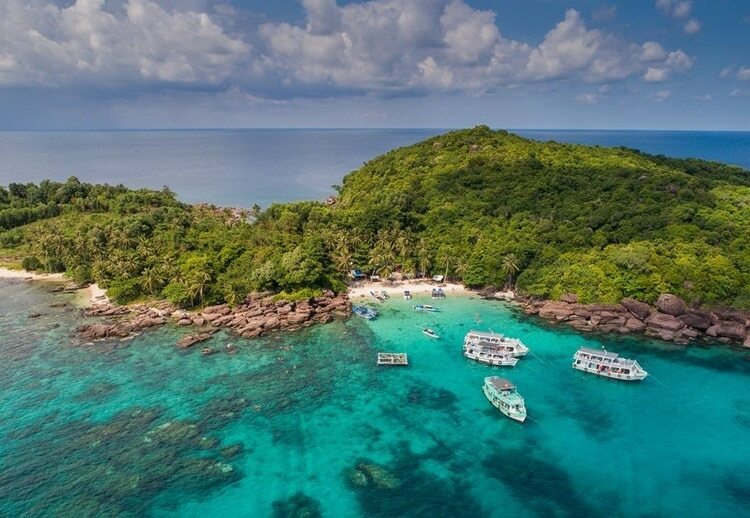 To get to Mong Tay Island from Ha Noi (Hà Nội) or Ho Chi Minh City (Thành phố Hồ Chí Minh), the common way is to take an airplane or coach to Phu Quoc, then catch a taxi to An Thoi port (cảng An Thới) and hire a canoe to the island. If you depart from Ha Noi, choose to travel by plane to save time. If you are in Ho Chi Minh City, a cost-effective way to reach the island is to take Kumho or Phuong Trang (Phương Trang) coach to Ha Tien (Hà Tiên) – a city located in the northwest of Kien Giang province. After getting off at Ha Tien station, transfer bus will drive you to Ha Tien pier. From there, you can pick Superdong or Ngoc Thanh (Ngọc Thành) high-speed boat to the island. The best time to visit “Robinson Island” is the summer months, which is also a good time for boat routes to the island. Besides, two other periods of time are also appropriate: April and October. These are the beginning and the end of the rainy season, the amount of rainfall decreases, as a result, the number of visitors coming to experience and explore is often less, making your trip more comfortable. It will be extremely unfortunate if you forget your swimsuit in the journey on Mong Tay Island. Therefore, remember to prepare a small backpack with essential items such as sunscreen, swimsuit, sunglasses, hat, and avoid bringing too much cash or expensive jewelry. The most important thing is to track weather forecasts to make sure not to set plan on stormy days. Above are the introduction and some information about Mong Tay Island. We hope you can find it useful for your upcoming plan. For more articles about other places to visit in Vietnam, go to our Vina site. And do not hesitate to leave a comment to question or share with us your story.